When representing a convenience store owner in a condemnation case, what are the first three questions an attorney should ask? NEW 2016! Robert E. Bainbridge, MAI and J.Casey Pipes, Esq. participated in a panel discussion on the valuation of convenience stores during the 2016 ALI-CLE Eminent Domain Conference in Austin, Texas. The presentation emphasized the importance of the highest and best use analysis in convenience store appraisal reports. Robert E. Bainbridge speaking at the 2016 ALI-CLE Eminent Domain Conference in Austin. "You're being a big help, enabling us to prepare our case properly and, today at the deposition, showing the State that their case is not properly prepared. Thank you." “We settled the case yesterday. We really appreciate all of your help on this case. It was invaluable to us. I look forward to working with you in the future as well. Thanks." “It was like talking to Moses [in discussing convenience store appraisals]." the reality of market value rather than reproducing traditional methodology. " "...your deposition was very good..."
NEW 2015! Mr. Bainbridge's article, "Convenience Stores and TRPs in Condemnation: Special Issues in the Application of the Income Approach", will appear in the 2015 March-April issue of the American Bar Association's Probate & Property magazine. This article explores the current debate concerning the use of the earnings-based income approach in condemnation cases involving convenience stores, gas stations and other trade related property. Written from an appraiser's perspective, this article advocates the use of earnings-based procedures for these types of properties. What Role is Right for Your Case? We provide independent, third party opinions of value (appraisals) for real estate, equipment and intangible business value associated with operating and non-operating convenience stores. 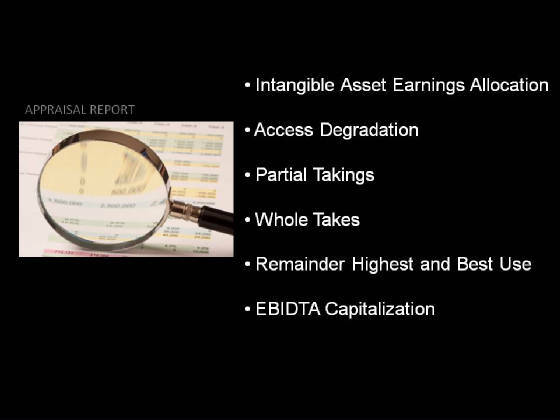 These are USPAP-compliant appraisal reports admissible as evidence in all courts of law. Our particular expertise in trade area analysis and site assessment for convenience retail concepts makes us effective at identifying alternative uses, when necessary. A state-certified general appraiser license is required in all 50 states for the appraisal of the real estate associated with convenience stores and gas stations. We maintain these certifications. In this role we can review the appraisal reports of both sides and offer testimony as to the appropriateness of the methodology and procedures. We advocate the earnings capitalization procedure income approach for convenience store appraisals and we are one of the few organizations in the country that can make persuasive arguments for its inclusion in appraisals of retail convenience real estate. This is an important issue today in the State of Texas. In this role, we offer our advice on how to strengthen a report or point out weaknesses for either side and testify in this capacity. In other words, we are not advocating any side in a case, we are advocating a procedure. Our goal is to help you win valuation disputes concerning convenience stores and gas stations. Most eminent domain appraisers are not specialists in appraising convenience stores. In this role, we bridge the gap by providing your appraiser with the required knowedge and skills. As a non-testifying consultant, our work is not subject to discovery. If your appraisal has already been prepared, we provide advice and assistance with case evaluation and strategy and help you amplify the strengths and minimize the weaknesses of your client’s appraisal report. We will also help you identify and exploit the weaknesses in the opposing appraiser's valuation report. Preparing the deposition for expert witnesses involved in valuation disputes concerning gas stations and convenience stores is a very specialized area of valuation expertise. We can assist you preparing effective, probing questions for deposing the opposing appraiser. 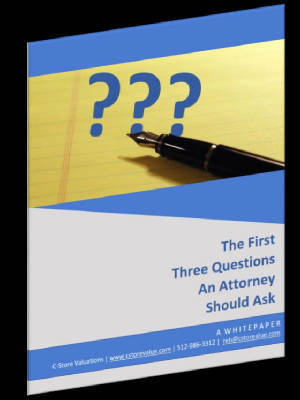 Many times, cases are settled at this point after the depositions of the appraisers becasue the opposing side realizes that they are not prepared. We can work with your other valuation team members, such as independent real estate appraisers and business appraisers to produce strong, technically correct valuations of convenience stores, gas stations and travel centers. We can advise you on pre-trial settlement and arbitration. NEW 2014! Robert E. Bainbridge, MAI will be presenting at the 2014 CLE Eminent Domain conference in Dallas to be held October 6th through October 7th. His topic will be “Convenience Stores and Trade-Related Property: Special Valuation Issues in the Application of the Income Approach”, exploring the current debate and appraiser’s perspective on the utilization of market rent versus earnings-based capitalization procedures in the appraisal of convenience stores and other trade-related real estate, such as fast-food restaurants, car washes, motels and travel centers. 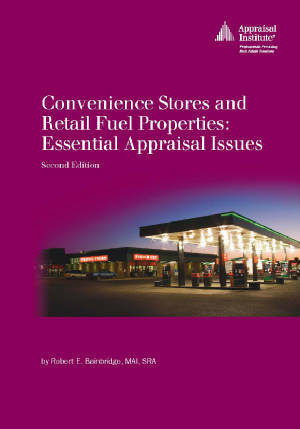 Mr. Bainbridge is the author of the Appraisal Institute’s text, Convenience Stores and Retail Fuel Properties: Essential Appraisal Issues. Mr. Bainbridge was a Featured Speaker at the 12th Annual 2013 CLE Eminent Domain SuperConference in Austin, Texas. His topic was “How to Correctly Appraise Convenience Stores in Condemnation”. 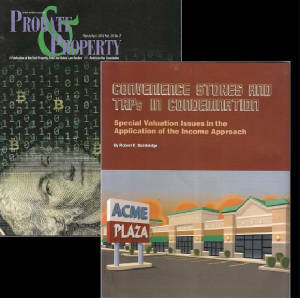 The unique nature of convenience store and gas station appraisals was explained, along with a discussion of the strengths and weakness of the three valuation approaches applied to these types of properties. Special location considerations for convenience retail real estate were explored along with examples of valuation resources available to appraisers. Mr. Bainbridge was a featured speaker at the American Law Institute | American Bar Association 2010 "Eminent Domain and Land Value Litigation Conference". The topic was entitled, "When Access and Use are Inextricably Tied: The Case for Greater Compensation for Convenience Outlets That Suffer Access Impairment". This presentation was rated 94% out of 100 by the attending Eminent Domain Attorneys and conference participants. Please click the link below to download a PDF file of the presentation material. of convenience stores and gas stations. 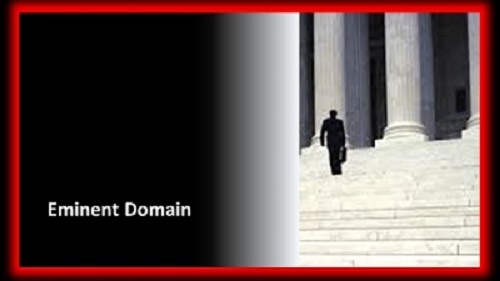 of eminent domain issues affecting convenience retail real estate ever published. 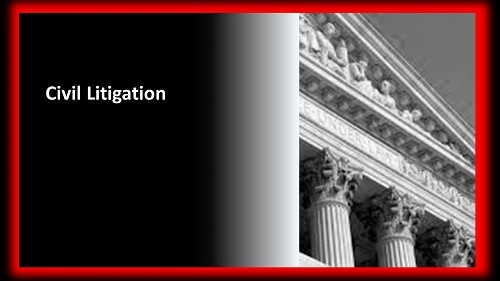 We provide expert witness and consulting services to attorneys across the United States. Learn more and order your copy by going to the "OUR BOOK" page. Please Click Here To Go To The "OUR BOOK" Page. The primary focus of our practice is the appraisal of tangible and intangible assets of single and multi-site convenience stores and petroleum marketing properties. “Retail Gas Properties and the Economics of Access” was published in the January/February 2010 edition of Right-of-Way magazine. This article is an introduction to the severe economic impact of access degradation to convenience retail real estate. 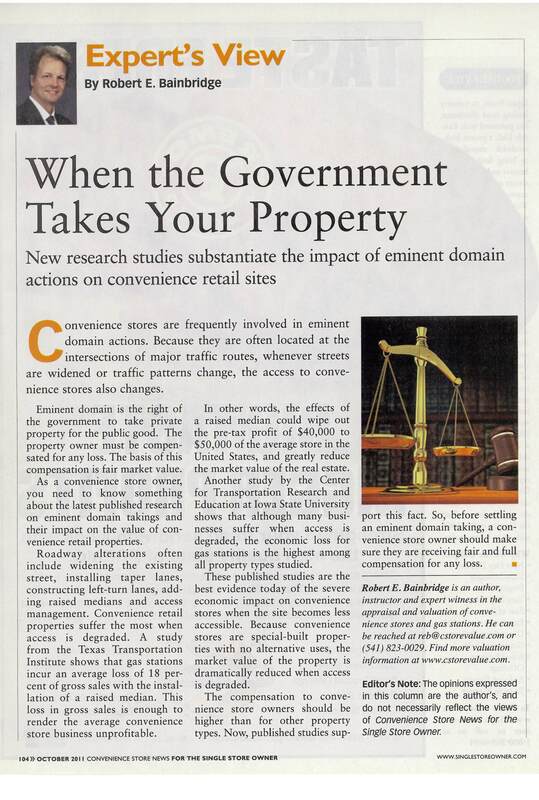 “When the Government Takes Your Property” was published in the October 2011 edition of Convenience Store News magazine and Single Store Owner magazine. This article argues that awards of just compensation should reflect the fact that convenience retail property suffers more than other types of real estate from access degradation. C-Store Valuations offers you the most powerful, knowledgeable and experienced valuation litigation team in the convenience retail industry. Our unique and diverse background draws on corporate real estate experience with major oil companies, acquisition and right-of-way experience with transportation departments, and the world’s most-published author of books and articles on the valuation of convenience stores and gas stations. Put the "A-Team" to work for you. Steve has been declared an expert witness in 27 U.S. jurisdictions in regard to roadway expansions and impact to gasoline and convenience store businesses. He has testified on behalf of private property owners in eminent domain trials for impact of loss of land, access and business operations. Steve joined Mobil Oil Corporation in 1973 with corporate responsibilities in retail marketing, site selection, site management of corporate owned convenient stores and gasoline facilities, gasoline and convenient store distributor business advisor. Steve joined BP Oil Company in 1989, supervising all BP corporate owned Washington State gasoline and convenience store locations. At the corporate headquarters in Cleveland, Ohio, Steve assumed duties in the Real Estate division for case management of all on-going and potential eminent domain cases for retail and terminal properties. When BP acquired Amoco sites in the mid-west and Arco on the west coast, Steve assumed management for entire portfolio of condemnation cases both on-going and potential takings throughout the U.S. Case load was approximately 250 cases. Steve is currently under contract with ExxonMobil for cases in New York, BP on the West Coast and independent Chevron and Shell dealers in the greater Seattle area. Paul recently retired from the Michigan Department of Transportation (MDOT) with a career spanning over 35 years. Paul was involved in construction, planning, traffic and safety. Paul was a technical supervisor and the Appraisal Section Manager in the Metro Region Real Estate Division. Paul was responsible for right-of-way estimates, right of way/access conflicts and other mitigation on all state highway projects in the Metropolitan Detroit area. Paul was also the Secretary for Chapter 7 and is a certified Senior Member of the International Right of Way Association (IRWA). Bob is an MAI appraiser and the author of the Appraisal Institute’s textbook, Convenience Stores and Retail Properties Essential Appraisal Issues, the standard industry textbook on the valuation of convenience stores and retail fuel properties. He has also authored valuation-related books for Royal Dutch Shell (Shell Downstream) and the Appraisal Institute’s, “Appraising Convenience Stores” seminar. Bob's articles on the appraisal of convenience stores and gas stations have appeared in The Appraisal Journal, Valuation magazine and Right-of-Way magazine. He writes a column on real estate-related issues for Convenience Store News magazine, the convenience industry’s largest-circulation trade magazine. Published works are recongnized by the courts as the qualifications of an expert. In private practice for over 30 years as a fee appraiser, Bob has completed valuations on a wide variety of property types, including hundreds of convenience stores and gas stations. Bob frequently consults and advises attorneys concerning the disputed area of the allocation of intangible asset earnings for gas stations and convenience stores. 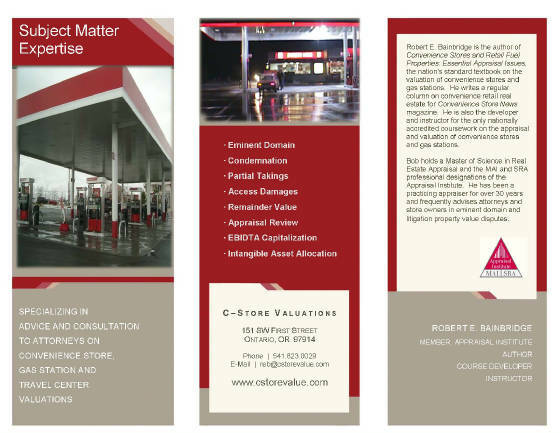 C-Store Valuations maintains the world’s largest repository of articles, reference works and publications on topics covering the appraisal and valuation of convenience stores and retail fuel properties. This material is cross-referenced and indexed for specific subject matter related to all aspects of appraisal and case law, including eminent domain, intangible asset earnings allocation and valuation of the real property. These sources provide efficient industry-recognized documentation for issues, questions and positions regarding the appraisal of convenience stores and gas stations. Our computerized data bank of over 300 questions for deposing and cross-examining expert witnesses in the appraisal and valuation of convenience stores and retail fuel properties is an on-going collection of knowledge and insight into successful convenience store property litigation. These in-depth questions cover industry standards, trade area analysis, the cost, sales comparison and capitalized income approaches. Each new case benefits from this accumulated storehouse of experience from all previous cases. Hundreds files are maintained on the sales and operations of convenience stores and retail fuel properties across the United States, especially unusual and difficult-to-value properties. This resource is continuously updated from a variety of sources. You may use the form below to quickly provide background information to us. Please be as complete as possible. You may click the SUBMIT BUTTON below to send the information electronically, or print and fax the form to (541) 823-0029. Our initial case review is usually free of charge.